The Hero Maestro Edge is one of the most premium models of scooters by Hero. It represents a big leap for Hero MotoCorp as it is one of the new products that was launched by the Gurgaon-based two-wheeler manufacturer since it split from its long-time joint venture partner. This scooter doesn’t share a lot with the standard scooter. It was built as a completely new product where the prime focus was on good looks and performance. Hero Maestro is powered by a brand new engine jointly developed with Austrian automotive firm AVL. This 111cc, single-cylinder air-cooled engine provides 8bhp and 8Nm of torque via a CVT transmission. Hero MotoCorp claims an efficiency of 64kmpl for the Maestro Edge, that should make it one of the most fuel-efficient scooters. The Maestro Edge carries a lot of beneficial features such as USB charging, under seat storage lamp, engine immobilizer, external fuel lid and a linked braking system. The instrument cluster holds a completely new design with an integrated digital display. The silencer gets a superb look along with a titanium finish for the cover while the tail lamp is an LED unit, and the grab handle is a single piece. It gets a host of practical touches like a front luggage hook, a massive 22-liter under seat storage compartment, and a front storage box. 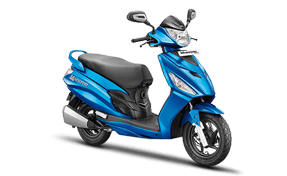 The Hero Maestro Edge comes out with all-new sporty identity to its predecessor Hero Maestro which was a successful attempt by Hero to leverage the perks of emerging scooter market in India. The new Hero Maestro Edge features a wide series cosmetic changes that include new appealing LED tail lamps, stylish headlamps with AHO (Automatic Headlamp On) feature, and 3D emblem on the sidelines. The stylish scooter also sports an eye-catching digital-analog combo meter console with a service reminder. This scooter is one of the best scooters in which the Hero deals. It is a first-class bike with lots of beneficial features and looks which makes it extra attractive. The affordable price is something that you must surely explore. It will also provide the desired comfort. The Maestro Edge draws potential from its new 110.9cc air-cooled, 4-stroke single cylinder unit delivering 8bhp @ 7500rpm worth of peak power and 8.7Nm @ 5500rpm worth of torque. The Maestro Edge delivers a mileage of 53kmpl (claimed) and is available in two variants: LX and VX. The Hero Maestro Edge is offered in nine color options: Shooting Night Star, Techno Blue, Matte Vernier Grey, Matte Blue, Panther Black, Pearl Silver White, Candy Blazing Red, Sporty Matte Grey & Red, and Active Matte Grey & Blue. The dual tone color theme costs you Rs 1000 more than the single tone shaded scooter that retails at a price of Rs 55,796 (On road, Delhi). This is a first class bike with lots of beneficial things that makes it stand out from the crowd. The great looks and helpful features make it an awesome choice. You will surely fall in love with the great looks of bike that gives it an outstanding look.